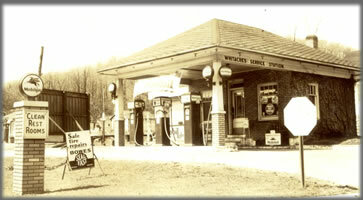 The first of its type, this virtual museum is dedicated to the preservation of gas station history. In this museum, you will see photographs of old gas stations and the equipment needed for their operation. Separate albums will assist the visitor in viewing old gas pumps, the advertising globes found on the tops of many of these pumps, the oil cans from many different companies, and other articles associated with the daily operation of the gas station. Although many of the items for view in this museum are in my personal collection, this virtual museum is the compilation of images gathered from many sources. 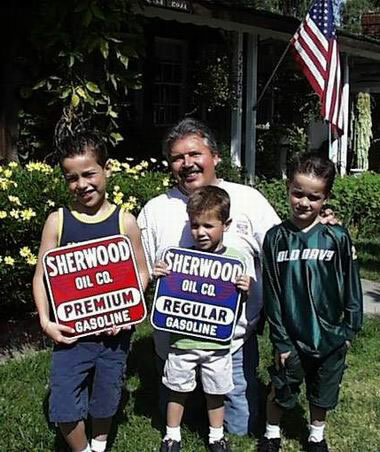 My second family is a group of collectors, who are highly motivated to saving the history of the gas station. On a daily basis, these men and women join each other to offer advice on restorations, how to locate the parts needed for that special project, share stories of their latest finds, and to dream about the next big addition to their collection. Many of these friends have provided images that helped me build this museum. None of these items are for sale through this site. It is simply a view into the past by those of us, who love the hobby. I hope that by visiting this museum, some wonderful old memories will come flooding back to you. If you check the section of “links”, you will be directed to other great sites that share our interest. The grand daddy of them all is www.oldgas.com , where the collectors gather daily. On that site, you will find other collectors listed by state, a free classified section, and companies that supply parts for a restoration that you might be involved in. As I’m always looking for items to add to this museum, I’ve provided a “contact us” link, where you can let me know if you have an item for sale. Thanks for visiting, and please come back. All rights reserved. Permission required.